One blogger reported to me that whenever she comes across a fabulous new post on a blog she's never seen before, she hesitates. And the reason is purely because she is worried about whether it was OK to comment on a new blog before she got to know it really well. She wondered whether providing immediate feedback was inappropriate within such a short introductory period, and was reluctant to show show her appreciation so readily. I'm afraid being this reluctant isn't helpful. If she is unwilling to comment, the author won't know someone has enjoyed what has been written, and the reader will have missed her chance to tell her so. There is no reason why anyone should hesitate before commenting. You need to learn to embrace your overwhelming desire to comment on a new blog by not holding back! Your reputation won't be at stake if you reveal your enthusiasm from the beginning. It isn't like a 'first date' when you have to be careful to not scare the other person away! Blogging can become a thankless task if you don't receive any comments on your blog. It's disheartening to toil away producing your best work, only to get nothing back in return. The blogger needs to have some sort of interaction to know they have a readership. This isn't the same as getting page hits, as this doesn't necessarily mean the visitors have read the posts. The blog's author can tell from those who comment on a new blog whether they are writing the right kind of content. They learn what their readers think and what they expect, and this will enable them to produce more of the same or even make improvements for future posts. Leaving a comment on a new blog is the reader's way of communicating with the blogger. They could, of course, send an email through the contact page, or engage with them on social media. But much of this would have little meaning away from the context of the actual post in question. Commenting is a continuation of the original post, and the best way is to think what you would say to the blogger if you saw them in the street, for example, and then merely write that (albeit one-way) conversation in the comment box. But it doesn't have to remain one-way. If the blogger responds to your comment, you could reply in turn. There is no reason why comments can't continue back and forth as the conversation develops. I once had a vibrant multi-threaded conversation through my comments with an enthusiastic reader, and it was very enjoyable. Commenting could be seen as a form of networking, especially if it is based around the format of giving as well as taking. Responding to show appreciation is one of those ways. Being able to comment on a new blog means you are able to thank the blogger for entertaining you with their content. However, you won't get an immediate response, as that is not how blog commenting works. Unlike social media, blog's don't work on real-time. Comments need to be moderated first as a precaution against spam. However, to make the process more pleasant, there are commenting plugins that provide a thank you, or even an appreciative gift in return if you are lucky. 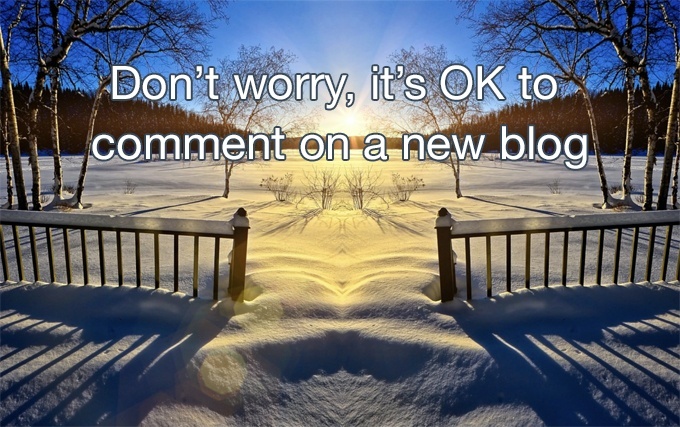 Restraining yourself due to politeness and worrying about how to comment on a new blog is a wasted opportunity. How can you establish that important relationship with the blog's author if you don't make the first move? Hesitating to leave a comment prevents you from having your say that could be important or helpful to the blogger. How else will they know what they have written has moved you to express your opinion? They could learn so much more from you if you become a regular commenter on their blog. And of course, consistent commenting on blogs that are relevant to your own cause can pay dividends in your favour. This is picked up by the search engines, and your good turn is rewarded by increasing your own blog's Domain Authority. Go on, take the plunge. You never know, you make even make the blogger's day, and encourage them to write more excellent posts. And think about how you can do this altruistic practice more regularly. It will help both you and those blogs you bother to comment on. And would you like to join a community where you can learn more about commenting on blogs? Join The Commenting Club – details are below! Do you remember your first comment? Does being controversial encourage comments? I love when I get comments on my posts, it really does brighten my day no End! I know I should do more commenting too, to share the love and the happy feelings so thank you for making me think about this in such a helpful way, reminding me why I like getting comments reminds me why I need to comment more! Thank you for your comment Esther, your comment has also brightened up my day! In fact it is the first comment I’ve got on this new website, so ironically you’ve taken the plunge to comment on a new blog! If you would like to join my community of commenters, we could explore together how commenting can benefit us all within the world of blogging. Thank you Shelley, and I love it too when people comment on my posts. It’s not difficult to do, and can make such a difference to the blog’s author. I love the way you said ‘listening’ when you could have written ‘reading’. Beautifully said Alice! As a new blogger myself, comments fill my heart and encourage me to keep moving forward even when it gets tough! I’ll certainly be more giving of my own commenting on posts that really inspire me…like this one! Thank you Alice for your comment. I’m glad this post inspired you. I’ll try to write some more, having had so much encouragement from you and other commenters. This is what commenting is all about – telling the blog’s author they’ve done a good job this time. Us Brits are very restrained aren’t we? We like queues and see what others do and then follow the crowd. (Unless you’re Jess Ennis or Usain Bolt who’s an honorary Brit!). I think there’s and element of culture involved in commenting and we need to learn a new way of caring and sharing, through support, commenting and interaction. Thank you for your comment Tracey-Jane. Yes, you’ve hit the nail on the head – Britons are wary about leaving a comment, and don’t rush in like our cousins from over the other side of the pond. The culture of commenting is gradually coming over to us, and younger people are much more willing to gush forth what they think in a comment, but there are plenty of people who prefer to have a more reserved approach. All they need is encouragement and guidance to solve this.